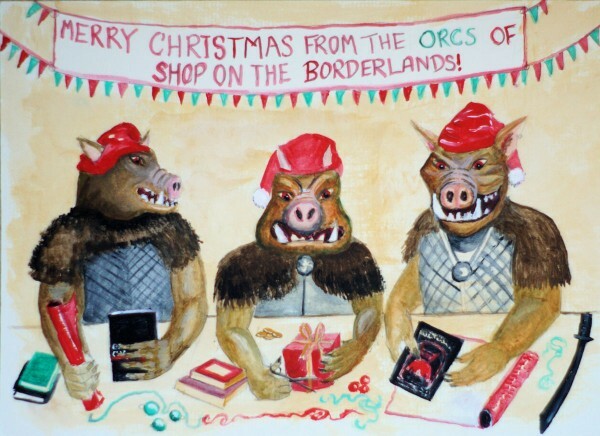 But instead a quick comedy portrait of Three Pigfaced Orcs Wrapping (with a cutlass) made for Pp's Shop on the Borderlands. I recently listened to an audio recording of The House on the Borderlands, so I finally understand this reference. Alas, no - this particular reference is to the Keep on the Borderlands an ancient D&D adventure. Wrapping presents with a cutlass! Perhaps that would stop me having shreds and rips and tatters. Probably wouldn't do much about the lumps, though. I wonder if I could curl ribbon with it. It's only this year I realized complaining about doing the wrapping is one of my oldest Christmas traditions.